Since the 1990s, the Sonic the Hedgehog series has struggled. When platforming games made the jump to 3D graphics, the Sonic franchise didn't progress after the original Genesis games. The downward spiral started with the Sega Dreamcast's Sonic Adventure in 1998, which combined the speed of past 2D Sonic games with awful open-world elements and too many new characters in 3D. Since then, the passionate and strange Sonic fan community clamored for Sega to recreate the magic of earlier Sonic games, specifically Sonic the Hedgehog 1 through 3 and Sonic & Knuckles. Their level design, tight platforming, and cool style appealed to many Sonic devotees, and they've been pretty vocal about how much the series lost its way. More recent attempts to revive the Genesis games' spirit, like Sonic the Hedgehog 4 and Sonic Generations, were well received but imperfect tributes. For years, Sega appeared unable (or unwilling, depending on who you asked) to capture that 16-bit Sonic magic. I don't have the same nostalgia and experience with Sonic, as I didn't have a Sega Genesis in my childhood home. Still, playing Sonic Mania feels like a nostalgic '90s trip to the hedgehog's origins. Too many years have passed for me to recognize all the 16-bit era Sonic references packed into it, but Sonic Mania’s modernized gameplay, killer soundtrack, and overall fresh style make it a must-play game in 2017. Sonic Mania was reviewed using a final retail copy purchased by the reviewer. Sonic Mania's elements feel instantly familiar but fresh. This is an homage to your fuzzy memory of Sonic games, not a faithful frame-by-frame remake. The goal of Mania is to race to the end and defeat the boss of each act in a series of zones within a 10-minute time limit. The game feels satisfyingly fun as you race through the zones' loop-the-loops, corkscrews, and other roller coaster turns. You can play through the relatively short single-player mode as Sonic the Hedgehog, Miles "Tails" Prower, Sonic & an AI-controlled Tails, or Knuckles the Echidna. Each character's movesets include the standard spin jump, spin attack, and ground spin dash, plus one more unique ability introduced in Mania. Sonic is able to use the new drop dash, an instant dash into a spin attack after landing from a jump. Tails can hover in air and swim quickly, and Knuckles can climb walls and glide after jumps. Learning when to build up your spin dash, when to time jumps with the new drop dash, and even when to avoid dashing take some time to perfect. A lot of this involves trial-and-error, so I died a bunch, especially when exploring each zone for the first time. Since each acts' twisting paths change so suddenly, I found myself frequently skidding to a stop after pushing the wrong direction from where the game's tracks were trying to guide me. Then again, these kinds of gameplay elements are core to Sonic’s design. Mania's colorful sprite-based visuals and remixed soundtrack feel like they fell out of a forgotten Genesis-era game. The game starts you off with the Green Hill and Chemical Plant Zones, which appear almost identical to the iconic first zones in Sonic 1. However, their bosses are completely new. I won't spoil Chemical Plant Zone's act two boss battle, but it's an amazing surprise that references another popular spinoff Sonic game directly. The third zone, Studiopolis, is where Mania starts to really shine with original level designs. The Studiopolis Zone is a brand new twist best described as a casino in a Hollywood TV studio set, filled with big marquees, lotto ball tumblers, and satellite trucks that beam you back and forth across the screen. The following 10 zones get progressively more challenging and interesting both musically and visually. The game's difficulty spikes quite a bit about halfway the playthrough, which unfortunately takes only about three to five hours to complete. However, there’s a lot of neat hidden stuff to unlock if you're up to replaying it, including new modes, mini-games, and a debug mode that allows in-game cheats. 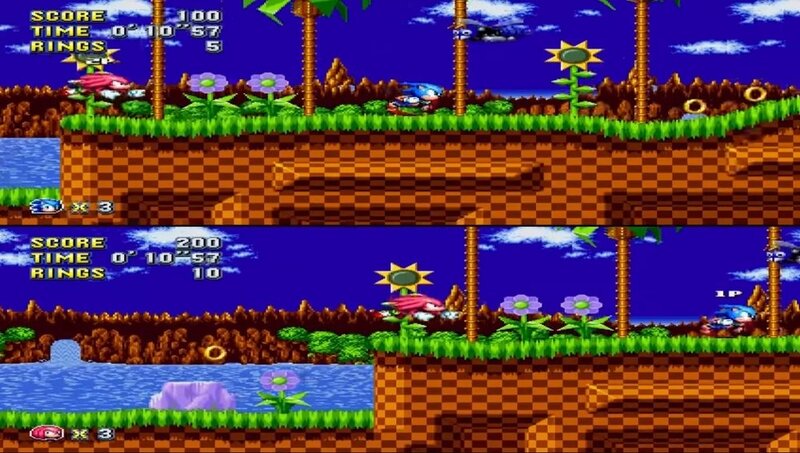 Also, Mania includes a competitive local splitscreen multiplayer mode, just like Sonic 1 & 2's versus mode. When I tried playing it on my Nintendo Switch, everything on-screen appeared squished down to fit the 16:9 horizontal aspect ratio, as you can tell from this screenshot. That felt a little awkward, but that didn't bother me as much as the lack of online multiplayer or local wireless play for the Switch. I think that Sonic Mania is still a bit too simple mechanically as a side-scrolling platformer, but to me, that was always an issue with the original 2D Sonic games. It feels great to dash through zones with any character, but once you slow down or slam into those irritating enemies, walls, spikes, or bottomless pits, the fun gets interrupted quickly. That balance between blistering speeds and tricky platforming has always been the conflict inherent to the Sonic series. The blue blur is at his worst while at his slowest, so my advice is to keep discovering easier paths you're comfortable navigating, even if it means missing out on hidden power-ups or bonus stages. Once I learned to stop worrying about losing all my rings, I had a much better time with the game: rebuilding top speeds is satisfying and easy. If 2D Sonic controls frustrate you, there's still much more to appreciate in this game. You can play it more leisurely, work your way through to the next checkpoint, and enjoy the game's incredible visuals and extremely catchy music. Sonic Mania was a “passion project” that “was born out of [Sega] fans’ love of the classic Sonic 2D platform games," according to Sonic Team head Takashi Iizuka, and I couldn't agree more. Mania remixes the Sonic formula in creative ways. I highly recommend playing Mania, especially if you haven't played any Sonic games since the originals on Genesis. For longtime Sonic fans who suffered through two decades of mediocre to miserable Sonic titles, Sonic Mania will feel like a revelation and triumph. It's a refreshing and unique revival of 2D Sonic gameplay. "Sonic Mania's nostalgic yet fresh gameplay design makes it a fantastic modern successor that Sonic fans waited too long for."